Get ready for some DRAMA! 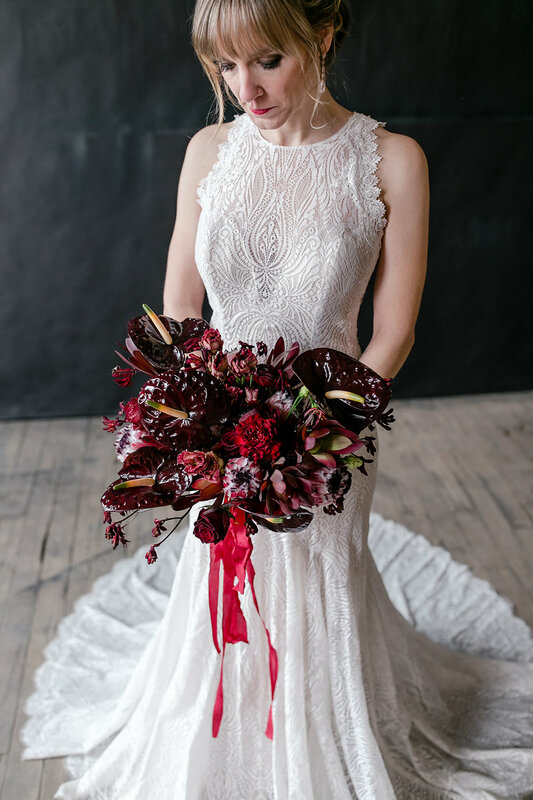 We partnered up with a few local wedding vendors this past month to create some dramatic Valentine’s inspired wedding inspiration and these photos from Samantha Suzanne Photography do not disappoint! This couch from Spruce Wedding Rentals was the perfect choice to fit our dark and moody vibe. Can you imagine taking your wedding portraits on a piece like this?! 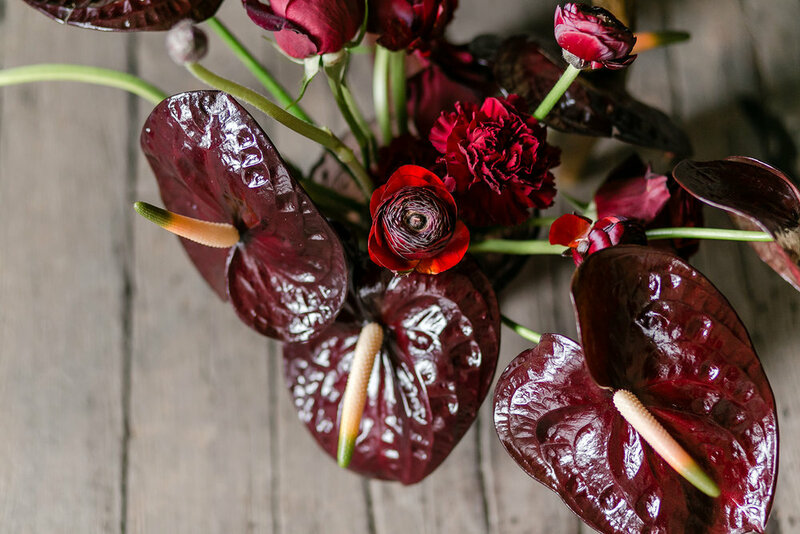 We chose a variety of dark red and burgundy blooms and intentionally left out any foliages to give these pieces a more modern feel. 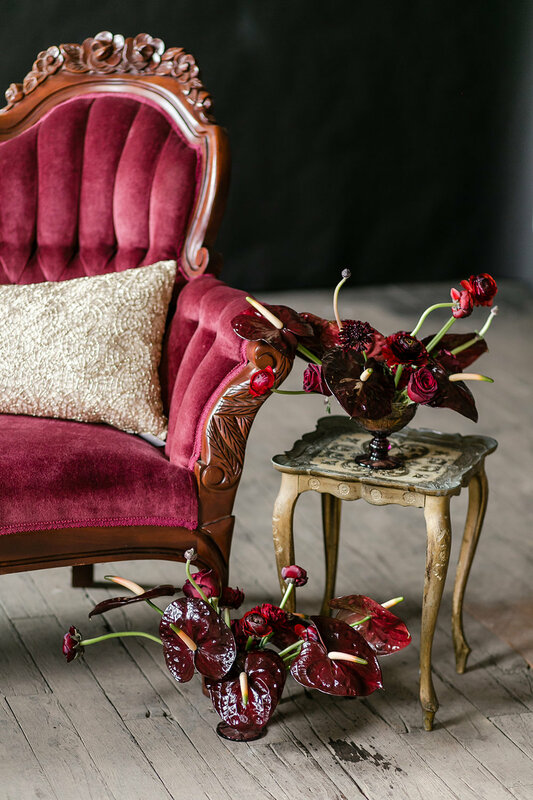 Burgundy has been such a popular wedding color for 2018 and 2019, we wanted to use this popular color scheme but give it a different spin. Protea, kangaroo paw, anthurium, ranunculus, lisianthus, carnations, roses and scabiosa all add a unique feel to these designs. For the desserts we chose black fondant to cover the cake to continue the elegant, dramatic vibe. Edible gold paint adds a nice contrast against the dark icing. And what better dessert to serve your guests than dark chocolate macarons and miniature bundt cake with fresh berries! Many thanks to these wonderful creatives who partnered on this project and we want to wish everyone a wonderful Valentine’s Day! Read more about why we love featuring our wedding flowers and desserts in styled shoots with other local vendors. A great place to get wedding inspiration!